Home :: Is a POS Machine Just a Computer? Is a POS Machine Just a Computer? * Is a POS Machine Just a Computer? - What is POS Software? 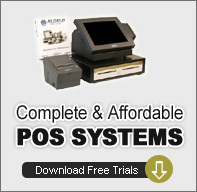 - What hardware do I need for a POS system? - What are Pole Displays? - What are barcode scanners? - What are magnetic stripe readers? - What are cash drawers? - What cash drawer options are Available? - What is a MICR or check reader? - What is a bar code label maker? - What is a thermal receipt printer? - What is an impact printer? - Do I need a database server? - I cannot get my serial printer to work? The answer to the question “is a point of sale machine just a computer” is both yes and no. All point of sale systems run off computers that we are largely familiar with – most commonly PCs but in some cases Macs as well. Large retail establishments may run their terminals as “dumb” terminals connected to back office large network servers where most of the processing is done. But they can still be considered “computers”. It is really software that defines a POS system. And unlike the computers that most of us use, many POS systems use touch screen monitors to eliminate the need for a mouse or keyboard. POS system computers also frequently connect to devices that we wouldn’t use at home – magnetic stripe readers to process credit cards, specialized receipt printers, pole displays to show customers what they are being charged, cash drawers that only open when a sale is complete, and bar code scanners that can scan in products based on their bar code. Devices called electronic cash registers (ECR) still exist and are in use across a variety of smaller businesses that don’t need all the functionality of a POS system. These are still “computers” with a variety of functionality, but are largely proprietary machines that need to be programmed by the vendor. If your business closes you can always convert your POS system to a home computer, but you will have no use for your electronic cash register! So if you have a computer and can get access to POS software you can install it and see how it works. This will give you an understanding of what is involved in configuring it for your business. Many vendors offer demo copies or full-fledged versions good for a limited time of their software to get acquainted with it. If you are new to POS, this may be a good route to go.